On the weekend I dropped off my two landscape paintings for the Peace River Chapter of the Federation of Canadian Artists. I'm delighted to have two pieces accepted in this show, and after a weekend spent hiking along the banks of the Peace River, I can tell you that we live in a beautiful region, full of painting inspiration! Can't wait to see the submissions from the many fellow local artists that I admire. My painting Huckleberry Hill is one of my accepted submissions. I love the way the sunlight streams through the trees and illuminate the foliage. This time of year the leaves are gone, but that just brings the focus to the landscape and the many colours in the bushes and shadows. My second submitted painting is my abstract landscape, Autumn Ablaze. I love the slashes of colour in this piece, and as a newly experimenting abstract painter, I can tell you that painting abstracts can be very freeing...or frustrating. This one was freeing. 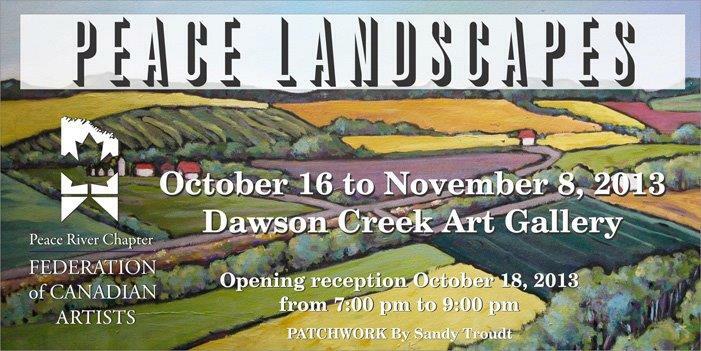 The opening for the show is Friday, October 18th, from 7-9pm at the Dawson Creek Art Gallery. You're invited!